The Karuwalagaswewa (Tabbowwa) wildlife sanctuary is in Sri Lanka’s North Western Province and was created to encompass traditional elephant migration paths which cross the existing A012 road. 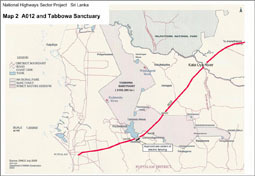 The project road is the western 70km stretch of the A012 from Puttalam to Anuradhapura. David Green provided Rapid Environmental Assessment and an Environmental Impact Assessment according to the ADB Environmental Assessment Guideline 2003 required because around 8km of the road passes through the elephant sanctuary. Tasks also included a review of the feasibility and detail design report and review of the IEE report, to identify additional information needed for the EIA with particular regard to ecological data from the wildlife sanctuary (e.g. coverage protected species, vegetation, bird migration etc.). Systematic consultation with affected people on the route identified general support for the road but concerns about human elephant conflict. 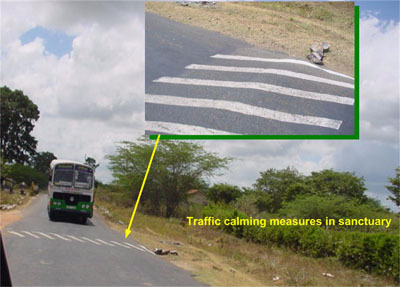 Environmental impacts on sensitive locations such as temples and schools were avoided by recommendations to fine tune the alignment and designs for the improvement works. Impacts within the sanctuary were moderated by recommendations for traffic calming, provision of alternative watering holes and control of the human elephant interface. Detailed assessment of the potential impacts enabled the completion of a thorough environmental management plan matrix with practical mitigation measures worked out in consultation with wildlife authorities and local affected people. Environmental management and monitoring plans were included. Bypass alternative routes for Puttalam town were also reviewed. David Green also took part in the consultation mission advising on all aspects of the Environmental Management Program.